Doctor Liliana Patrucco, a neurologist and head of the Department of Demyelinating Diseases at the Italiano Hospital explained that they are among the main novelties of this event, that today "Both physical and cognitive rehabilitation can be done not only face to face, but also virtual use of technology that is known as telereurorehabilitationthrough software designed specifically to allow a patient from home to meet certain goals, always supervised by a specialist, who can be a physical rehabilitator, worker or neuropsychologist who is responsible for the cognitive aspects of the patient. " In order to be able to perform teleuroregulation, it is necessary to have a PC or tablet in which teleneurorehabilitation can be installed. a comprehensive virtual reality program based realization of exercises that are trapped by the sensor and reflect on the screen, which allows them to express themselves in a playful way. For example, the monitor displays fruits that the patient must hold in the appropriate shelf. Realizing real movements, what a person does is reflected on the screen. That allows work fine movement of precision and coordination, but there are also exercises that suggest a person's march. Neurologist Edgardo CristianoDirector of the Multiple Sclerosis Center in Buenos Aires (CEMBA) of the Italian hospital said that this trend is increasing, "mainly because it allows shortening the distance, taking into account that all people can not physically go to places where this approach is made. , he recalled thatrehabilitation and physical activity of patients with multiple sclerosis are aspects that do not have everything they deserve but are fundamentally in treatment ". That's exactly with this approach It's about restoring functionality. "There are some skills that may not be able to recover, but others, with appropriate strategies, can continue to lead a normal life," he said. This is the key concept of plasticity, since It has long been observed that by exercising body and brain, neurons of those areas that are damaged by condition in their functions are replaced by others who remain healthy. One of the speakers in the event was an Italian doctor Giancarlo Comi, President of Charcot Foundation and pioneer in this type of approach, who explained that these therapies are looking for "tissue reorganization for the recovery of several functions ", Moreover, some connections between certain areas of the brain are not recovering. That's it with proper rehabilitation "the activity of these neurons can be taken from other undamaged areas"
At the same time, he was concerned that in his country, Italy, MS is growing in the number of cases. In fact, in only 15 years the cases have doubled and today there are about 20 thousand patients. This increase is also reported in Argentina, says dr. Patrucco. Multiple sclerosis is a chronic and disabling immunological disease, the product of damage that occurs in myelin, or in a layer covering the nervous fibers of the central nervous system. 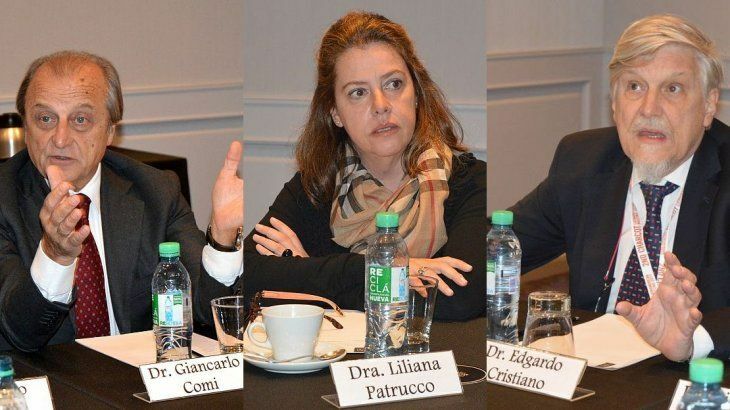 According to data provided by specialists, The prevalence of this pathology, which usually represents the first symptoms between 18 and 40 years, is 32 per 100 000 inhabitants, with an estimated 14,000 to 18,000 patients in Argentina. It affects more women than men, in relation to 3 females for each man.